The Mac & Cheese Fest at Copper offers activities for kids as well as live music. What: Fourth annual Mac & Cheese Fest. When: 10 a.m. to 5 p.m. Saturday, July 28, and 10 a.m. to 5 p.m. Sunday, July 29. Where: Copper Mountain Resort, 209 Tenmile Circle. Cost: Each ticket costs $1, and samples average five tickets. More information: Visit coppercolorado.com to purchase tickets in advance and to see the full schedule of activities and music. COPPER MOUNTAIN — Prepare your taste buds for ooey-gooey, sweet and savory deliciousness. Copper’s Mac & Cheese Fest returns for the fourth year in a row on Saturday and Sunday, July 29 and 29, and offers food and entertainment for everyone. An entire event centered on a pasta dish may seem out of the ordinary, but for the folks at Copper Mountain, it was a natural extension of the resort. As officials brainstormed ideas for the latest and greatest festival, highlighting the Center Village’s popular cheese-focused restaurant Mountain Melt felt like the solution. “People rave about Mountain Melt and the chefs love the festival,” event organizer Holly Robinson said. The first year had roughly 1,500 visitors, but that quickly spiked to 6,000 in year two. Robinson estimates that 8,000 people will go to this year’s two-day festival to try food from over a dozen vendors. Attendees can look forward to samples such as mac and cheese wontons from Storm King, kielbasa mac and cheese from Andy “The Austrian” Grogger and a gruyere, smoked gouda and balsamic reduction mac and cheese from Trickledown Bakery and Cafe. Additionally, vodka cocktails have been paired with the majority of the dishes. If someone doesn’t want mac and cheese but wishes to satisfy their sweet tooth, then they can purchase goods from vendors such as City Pop Popcorn and Mountain Top Cookie Shop. While there are additions to the festival each year, this time around there is one subtraction. The $1,000 grand prize has been eliminated, and there will not be judges for the mac and cheese dishes. According to Robinson, the change allows attendants to not feel pressured to eat samples from every vendor, thereby creating a more inclusive and relaxed environment. Though there isn’t a contest this year, Copper’s Executive Chef Justin Peterson is still prepared to cook up award-worthy dishes. Peterson, who has worked at Copper for 16 years and prides himself on overseeing the resort’s made-from-scratch restaurants, crafted the Mountain Melt, which won once before at the festival. This year, he will have a ground buffalo and smoked bacon mac and cheese with tobacco onions and a roasted tomato pickle relish available and the recently opened Downhill Dukes will sell samples of braised beef short ribs mac and cheese with caramelized onion and gruyere croutons. Both recipes are twists on the restaurants’ normal offerings, subbing buffalo in the Mountain Melt’s popular beef cheeseburger and adding short ribs to Downhill Duke’s French onion toast. Paired with the former is a Palisade peach and vanilla cocktail while the latter will be served with strawberry lemonade vodka, raspberry liqueur and ginger beer. Peterson didn’t concoct those drinks, rather, the front-of-house staff at each restaurant came up with the recipes. “Mac and cheese and booze doesn’t automatically pop into my mind but people love it,” Peterson said. Prizes will still be awarded to the popular eating contest, however. 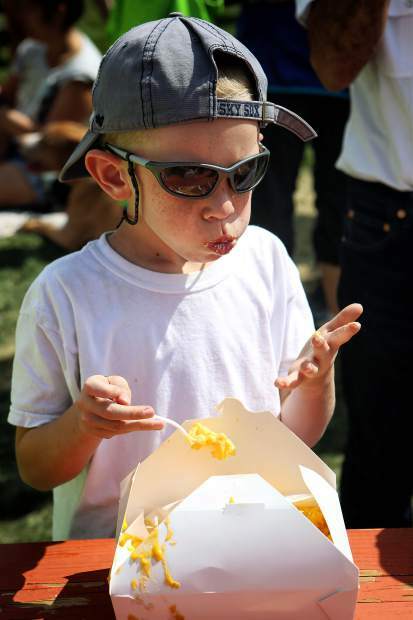 Held for both kids and adults on Saturday and Sunday, the event challenges to see who can eat two pounds of mac and cheese in two minutes first. Bands will perform both days as you dine on the samples. Taking the main stage are Miles Apart, Funk Nuff and DJ Landry. SUSTO, an alternative country-rock band from Charleston, South Carolina, will headline the festival. New this year is a parkour demo at Woodward with Jesse La Flair and multiple shows by Denver’s Magic Rob in the village. Kids can also enjoy face painting and Copper’s other activities such as bungee jumping and go-kart racing. If you can’t make it to the festival, then you can always create mac and cheese to eat in the comfort of your own home. According to Peterson the key to making good mac and cheese is a firm al dente noodle and a simple sauce made of high quality cheese and cream instead of bechamel.